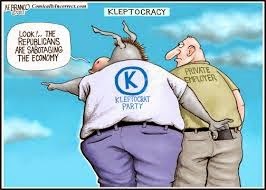 Kleptocracy: "...a form of political and government corruption where the government exists to increase the personal wealth and political power of its officials and the ruling class at the expense of the wider population, often with pretense of honest service." It's still Class Warfare, gang. The Bush 43 Administration was a past master at kleptocratic theft of our money, as we see in an article titled, "Report: $6.6 trillion lost on Bush tax cuts could pay all student loans, car loans, credit cards." "A new report argues that the Bush tax cuts actually cost Americans $6.6 trillion in personal income — more than enough to pay for every student loan, car loan and credit card debt in the U.S.
...even though there's a little confusion about what the Conservative pols are telling them. "Bombshell: Former Oil Company President Says Political Contributions Amount to Extortion (Video)." "Former Shell CEO John Hofmeister hates paying politicians. It’s not right, it’s not democratic, and above all, it all amounts to legalized extortion. Or, at least, that’s what he told CNN’s Drew Griffin on the subject of paying his yearly legalized bribes — 'campaign contributions' — to Washington insiders. "I feel extorted. Every time I wrote a check I felt that it was a form of extortion, the price of entry, because of the reception that you got when you contributed versus the reception when you did not contribute." "Self-described 'impartial straight-shooter' Hofmeister then went on to tell his tale of woe, of a poor, honest businessman routinely harassed by political fundraisers at the spearpoint of persecution..."
No one is saying that Democrats are innocent of kleptocracy, but the Conservatives live it. To paraphrase an old Conservative capo, $6.6 trillioon here, $6.6 trillion there, and pretty soon you're talking real money.